I am loving the 3-D Wednesday's at My Creative Time.....we challenge you to create something but, no cards and no layouts. 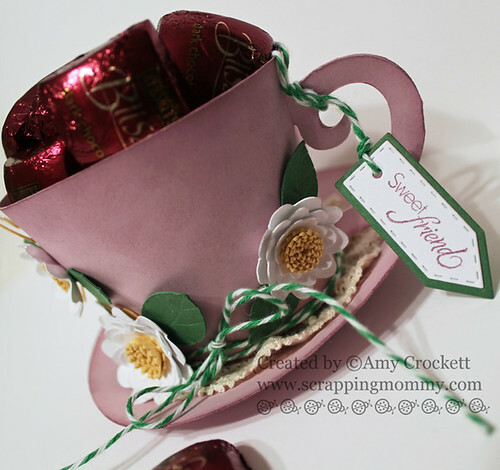 I used the new Tags Bags Boxes and More 2 cartridge with my Cricut to cut out this sweet little tea cup filled with my *favorite* chocolates. I added a little bit of distressing to the cup with some same toned ink to make it look a little antiqued. I added some super cute flowers from the Flower Shoppe cartridge along with a fun little swirl from the Cindy Loo cartridge. I added some texture to the leaves and petals with an embossing stylus. The "Sweet Friend" sentiment is stamped and die cut with the Teeny Tag Greetings kit at My Creative Time. I used a little bit of lace around the bottom of the cup to decorate it up a little and then added some fab bakers twine from The Twinery. So, what do you think?? I think that I will be having a whole lot of fun playing with the new Tags Bags Boxes and More 2 cartridge along with My Creative Time Stamps!! Don't forget to leave a comment below and then hop on over to Emma's blog to see what the other super talented designers have created, to play along, and to see who the winner for the new release blog hop is......it could be you!! This is gorgeous!! I really want this cartridge!! Can't wait for my teeny tag greeting kit arrives in the mail!! Your teacup is adorable. Would also make a great shower favor. Great job on everything. I'll have to get this cart. This is so pretty, Amy! I've had my eye on this cartridge for this particular cut - so cute! I love how you dressed it up!!! 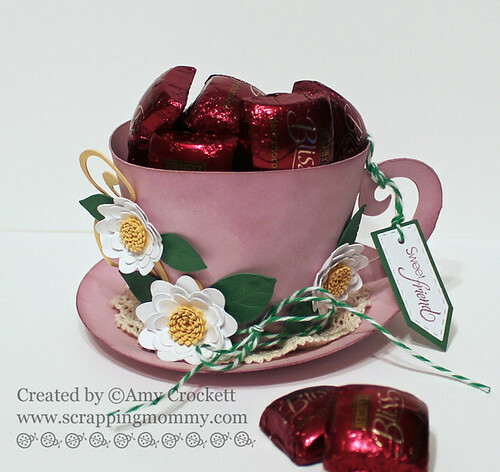 Amy ~ your tea cup looks so real until I read your post! It is so BEAUTIFUL! Those flowers are simply GORGEOUS! The lace at the bottom ~ nice touch! Just when I think I don't need that cartridge ~ you have proved me wrong! Absolutely elegant! 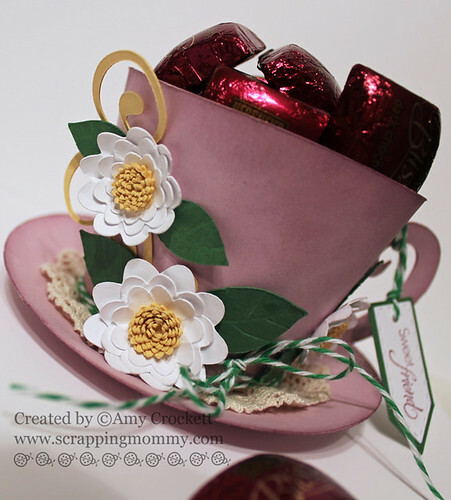 Oh that is so cute, I love teacups and this one is even better with the chocolates! I can't wait to get this cartridge, thanks for sharing your wonderful creation! oh my this is FABULOUS!!! if fact you just made me go and order this cart! yep, left here, ordered, then came back to comment! great and creative project. could be used for so many things. how about a wedding shower? Great job! The tea cup cut is great...the doily and other embellishments are wonderful together! Awwww....this is such a cute cup...love it! Thanks for sharing Amy! Wow That is incredibly GORGEOUS!!! I am officially jealous I don't have that cart!! beautiful project girl! !